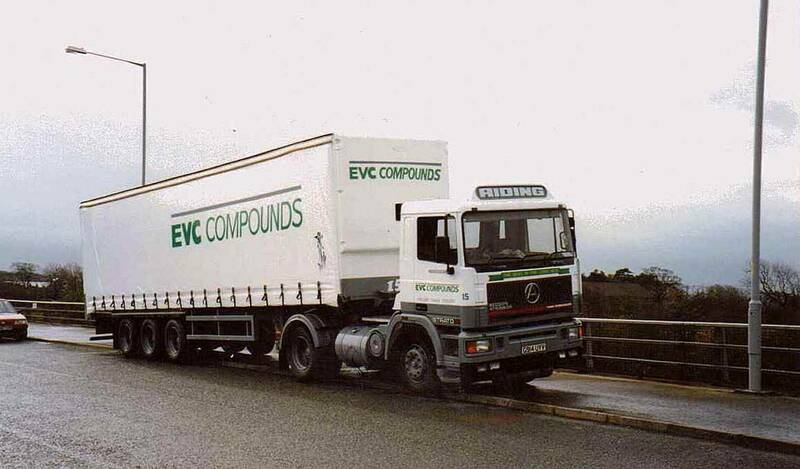 European Vinyl's Corporation Ltd (EVC) was formed in October 1986 as a joint venture comprising of the VCM and PVC resin and compounds businesses of Italy’s EniChem and England’s ICI which were, at that time, Western Europe’s second and fourth largest PVC producers respectively. With their history of supplying a reliable powder transport system for ICI it was natural that W & J Riding were given the contract to move vast amounts of pvc powder across the country and consequently gave part of their fleet of tractor unit's and tankers the grey and white EVC livery. 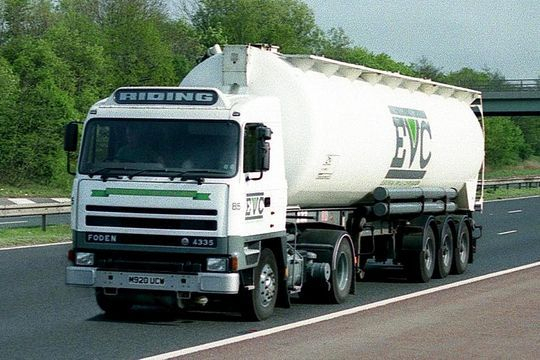 In March 2001, the INEOS Group acquired a majority shareholding in EVC and by 2005 EVC became wholly owned by INEOS Vinyl's UK Ltd, which today, is Europe’s leading Polyvinyl Chloride (PVC) manufacturer and currently ranked fifth worldwide. 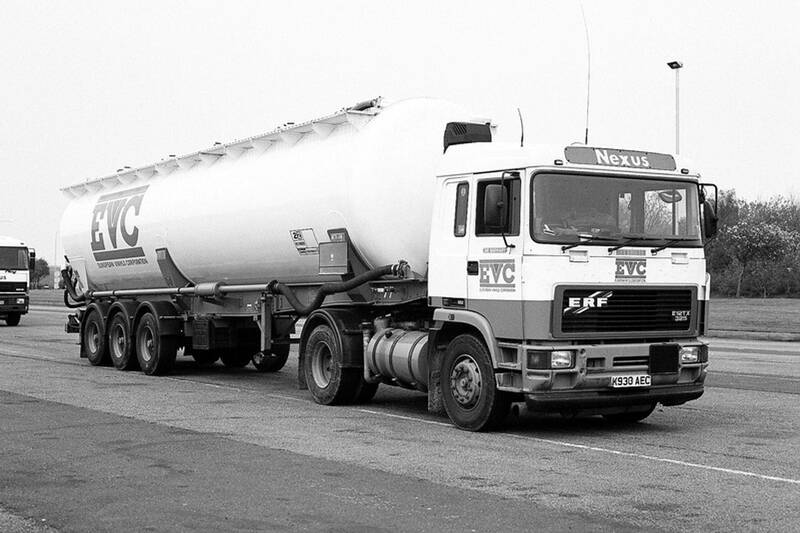 Powered by a Cummins L10 290 engine and driven from new by the late Ted Woods this was the first tractor unit to be assigned to the contract. 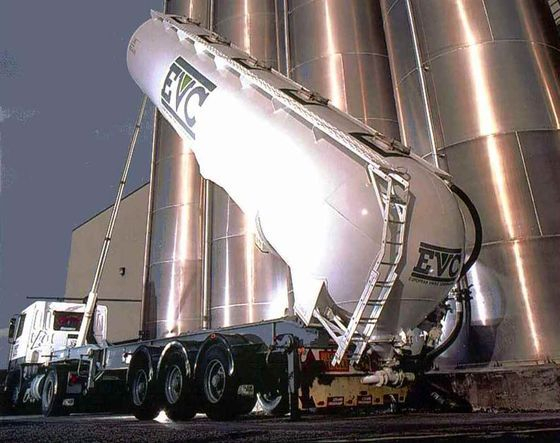 Painted in the grey and white contract livery of European Vinyl's Corporation Ltd it is pictured here while coupled to a Crane Fruehauf 55 cubic metre tipping tanker also in EVC livery. Another shot of ERF E10 Series 4x2 tractor unit Reg No F270 YBV Fleet No 20 'Royal Sovereign' again coupled to its own regular tanker No 122. Built by Crane Fruehauf it was the first tanker Riding's bought that was fitted with air suspension. 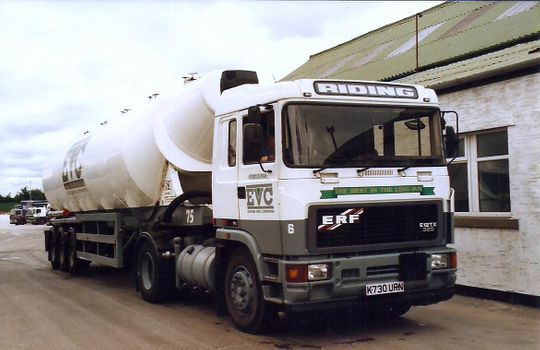 Pictured here while parked in the depot at Longridge notice how the makers have incorporated the tipping ram into the tank body thus gaining overall length and increasing capacity. Driven by the late Bill Lambert it is seen here in European Vinyl's Corporation Ltd livery coupled to a 2000 cubic foot non tipping tank built by Carmichael. A nice location shot showing Seddon Atkinson Strato Reg No F815 GNA Fleet No 17 'High Chieftain' which is seen here having just loaded with Corvic at the ICI Runcorn plant. Driver of F815 GNA, the late Bill Lambert, took this photograph in 1996 a few months after Tom Riding had retired from the company. 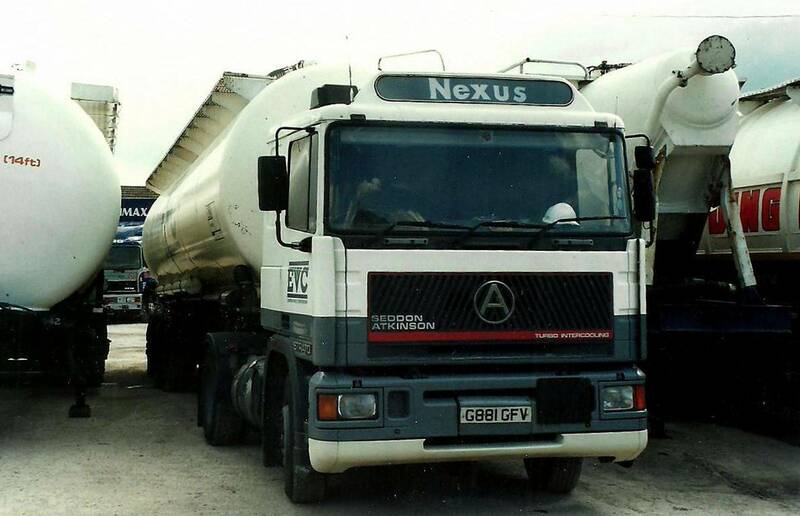 By this time F815 GNA had already acquired its Nexus branding along with the ERF on the right, now in a scarab green Nexus livery. Bill Lambert, who was a driver with Riding's for over 40 years, sadly passed away on the 30th of December 2014. EVC liveried Carmichael 2000 cubic foot tipping powder tanker is seen here discharging its load of plastic powder granules at the Y.I.P factory in Leeds. 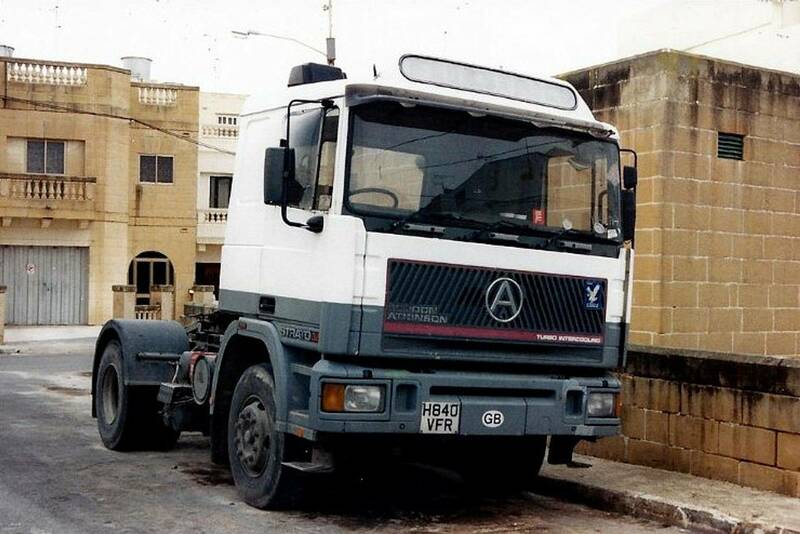 Driver Mick McKay, who took the photograph, was driving Seddon Atkinson 301 Series 4X2 tractor unit Reg No C150 BKP Fleet No 92 'Sir Lancelot' at the time. 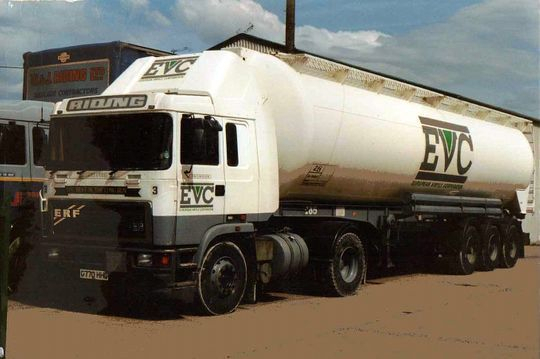 It is pictured here parked in the depot at Longridge while coupled up to a 2000 cubic foot tri-axle Metalair tipping tanker also in EVC livery. 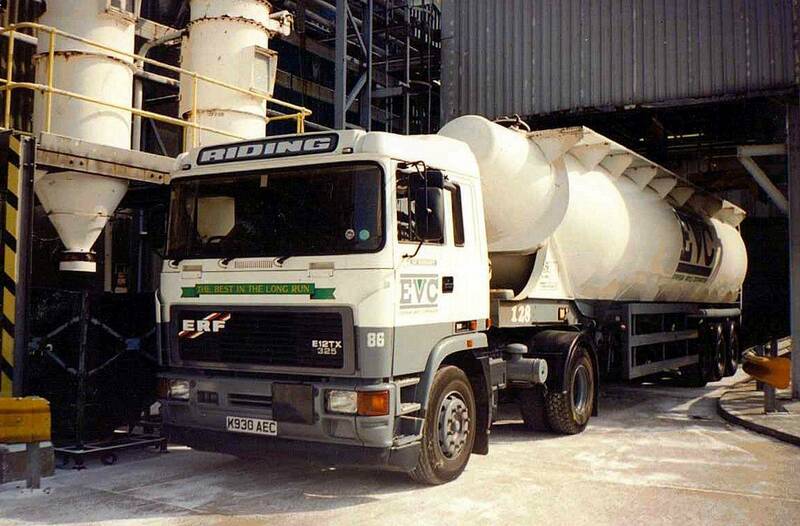 Another shot of 'E' Series ERF 4x2 tractor unit Reg No G770 HHG Fleet No 3 'Snowdon'. 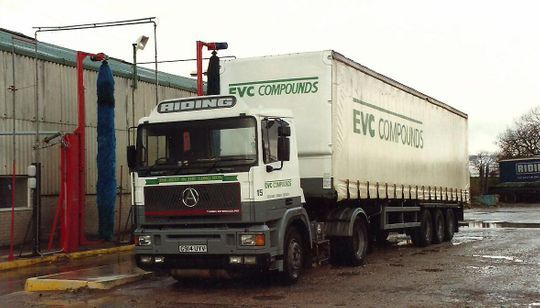 Registered new by Riding's on the 1st of September 1989, at a cost of £31,636 plus vat, it is pictured here parked up in the depot at Longridge. 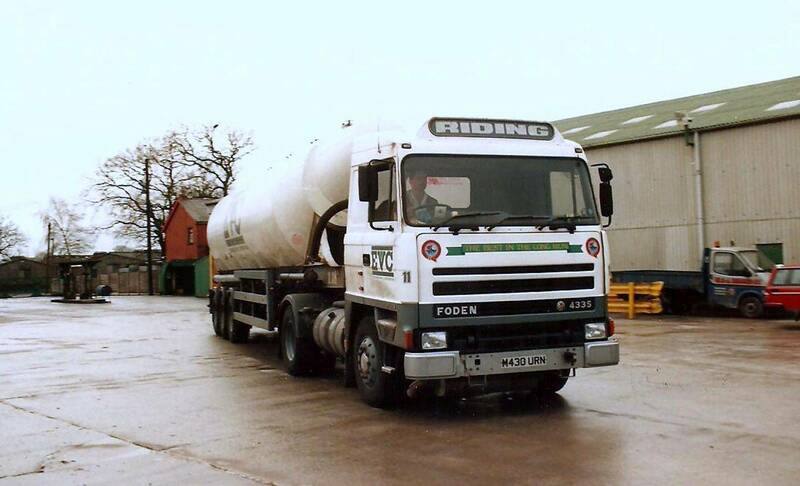 Registered new on the 1st of September 1989 Seddon Atkinson Strato 4x2 tractor unit Reg No G881 GFV Fleet No 95 'Morning Star' was powered by a Cummins 14 litre engine. 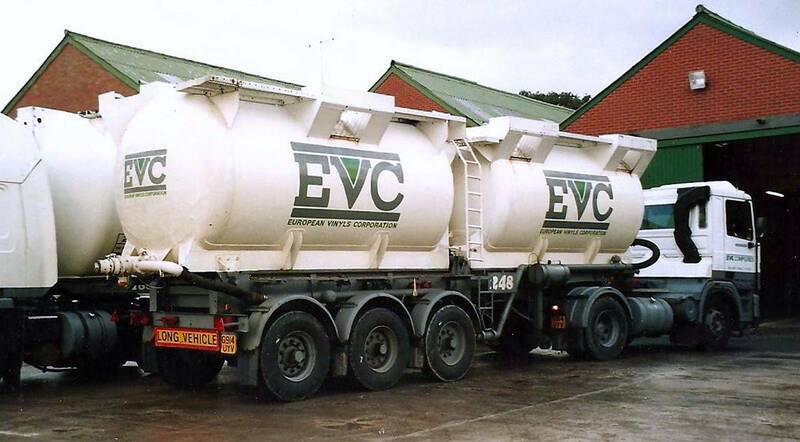 In the contract livery of European Vinyl's Corporation Ltd (EVC), it is coupled up to a 2000 cubic foot Metalair tipping tank also in EVC contract livery. Another shot of Seddon Atkinson Strato 4x2 tractor unit Reg No G881 GFV Fleet No 95 'Morning Star'. Seen here at Longridge depot in 1996, shortly after the retirement of Tom Riding, the old Riding headboard has by this time being replaced with the TDG Nexus logo. Day cabbed Seddon Atkinson Strato 4x2 tractor unit Reg No G914 UYV Fleet No 15 'Conquerer' registered new on the 1st of November 1989 was in the livery of EVC Compounds. Seen here parked next to the wash at Longridge this particular Strato was out based at Runcorn along with the curtain-sider trailer also in the contract livery of EVC Compounds, a subsidiary of European Vinyl's Corporation Ltd.
Running on a daily basis between European Vinyl's Corporation's Helsby and Wrexham factories it was driven on a regular basis by Chris Davis. Another shot of day cabbed Seddon Atkinson Strato 4x2 tractor unit Reg No G914 UYV Fleet No 15 'Conquerer'. Out based at Runcorn this particular Seddon Atkinson Strato and curtain-sider trailer were both in the contract livery of EVC Compounds which was a subsidiary of European Vinyl's Corporation Ltd.
Running on a daily basis between European Vinyl's Corporation's Helsby and Wrexham factories G914 UYV was driven on a regular basis by Chris Davis. Again we see day cabbed Seddon Atkinson Strato 4x2 tractor unit Reg No G914 UYV Fleet No 15 'Conquerer' but this time hauling a tri-axle powder tanker. 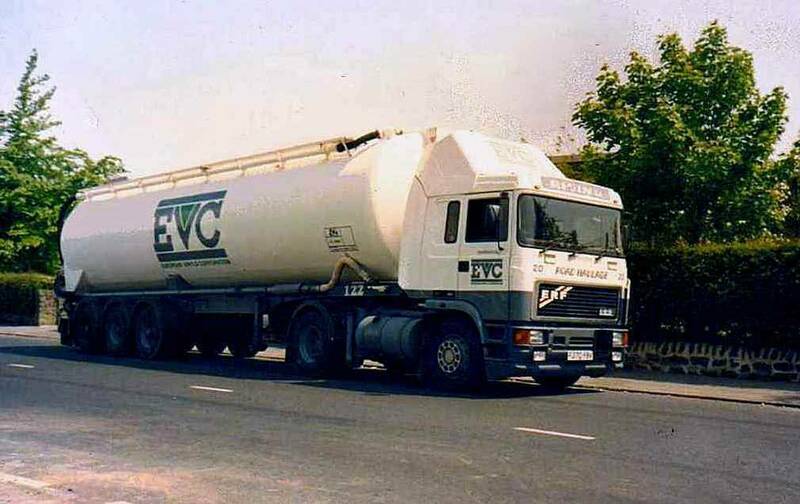 The unusual tanker, built by Carmichael of Worcester, was originally part of the BICC fleet where it was pulled by a tilt cab Leyland Beaver but when EVC took over the business the tanker was allocated to Riding's for a nominal fee. 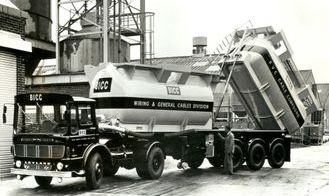 The two tanks were built to enable two different coloured products to be carried at the same time with the plastic granules compounded at Helsby and transported to Wrexham. The hydraulic motor and the Holmes blower needed to tip and discharge the tanks were driven by a Ford four cylinder diesel engine carried under the tanker. 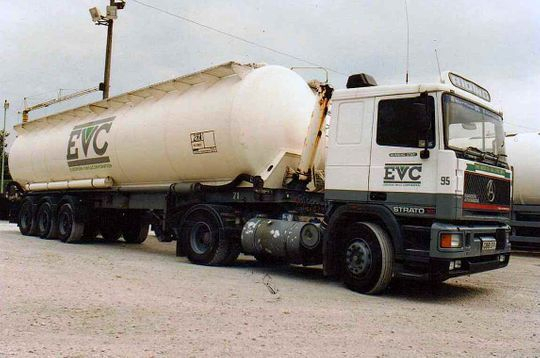 G914 UYV was used to pull either this tanker or a tautliner as and when required. Another shot of day cabbed Seddon Atkinson Strato 4x2 tractor unit Reg No G914 UYV Fleet No 15 'Conquerer' which was driven on a regular basis by Chris Davis. Besides pulling an EVC livered curtain sider trailer it was also allocated, as and when required, to pull this twin powder tanker which was used to transport plastic granules from Helsby, were they were componded, across to Wrexham. 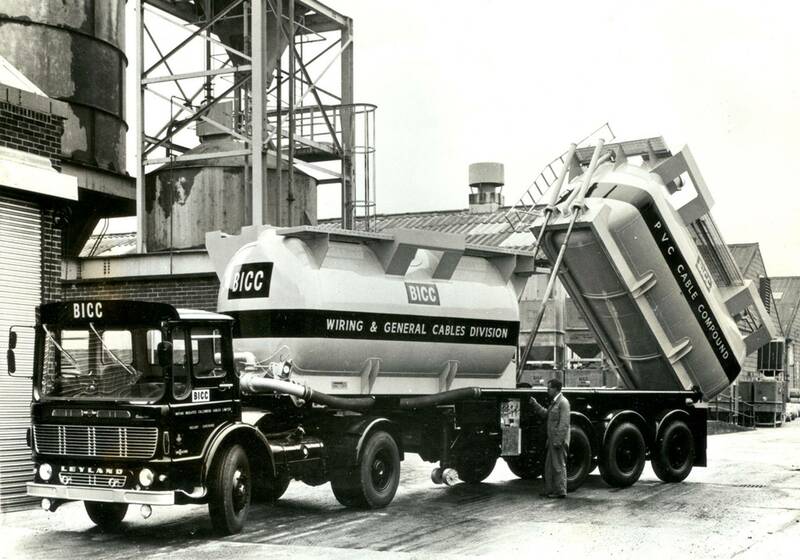 The unusual tanker, built by Carmichael of Worcester, was originally part of the BICC fleet. A close up shot of Riding's twin powder tanker. The concept of having two separate tanks enabled two different coloured products to be carried at the same time. 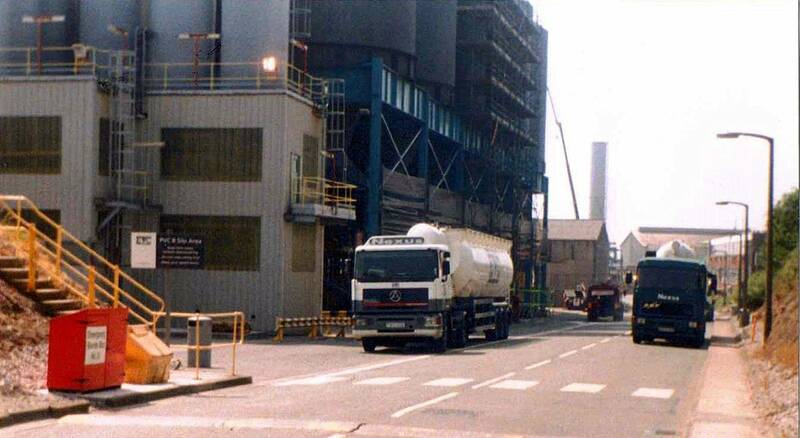 Out-based at Runcorn it was used to transport plastic granules from Helsby, were they were compounded, to Wrexham. Being out based at Runcorn it was rarely seen at Longridge except on occasion's such as this when it had been sent over for either a routine service or MOT preparation in Riding's own workshops. Seddon Atkinson Strato 4x2 tractor unit Reg No H840 VFR Fleet No 1 'Precursor' was registered new on the 17th of August 1990. Powered by a Perkins 335 TX engine in line with a Fuller twin speed splitter gearbox it is pictured here on Sunday morning the 19th of August 1990. 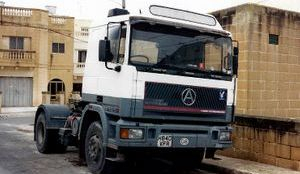 This was its very first day on the road and driver Mick McKay, on the right, can be seen preparing to load his gear into the cab. It is coupled to a Carmichael tipping tank in Riding's livery that was used exclusively on the movement of Corvic paste to Nairn's of Kirkcaldy. A pair of Riding's powder tankers are seen here while the drivers take a break on the M6 Southwaite service area in Cumbria after tipping their loads of plastic granules at the Mainetti manufacturing plant in Jedburgh Scotland. 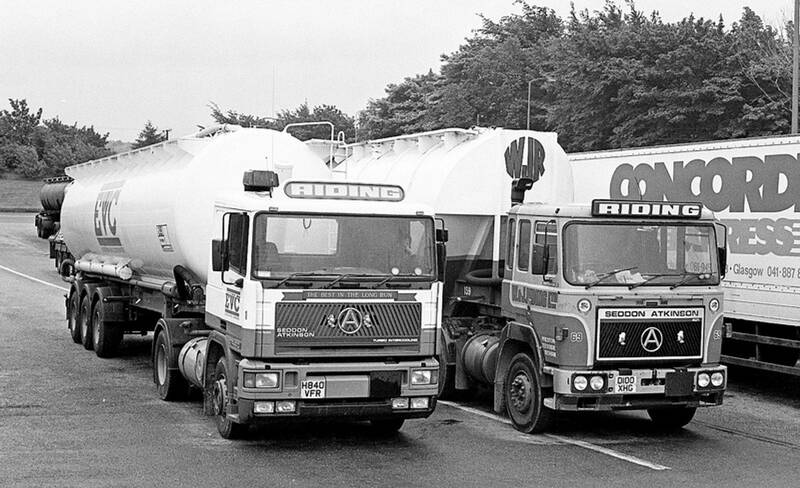 On the left, painted in European Vinyl's Corporation (EVC Ltd) contract livery, is Seddon Atkinson Strato 4x2 tractor unit Reg No H840 VFR Fleet No 1 'Precursor' which was registered new to Riding's on the 17th of August 1990. 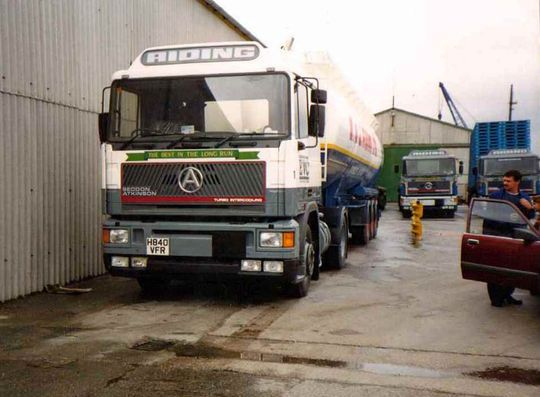 On the right, in standard W & J Riding livery, is Seddon Atkinson 401 Series 4x2 tractor unit Reg No D100 XHG Fleet No 69 'Hotspur II' which was registered new to Riding's on the 1st of March 1987. Perkins TX engine and subsequently this engine proved to be very durable and very efficient. 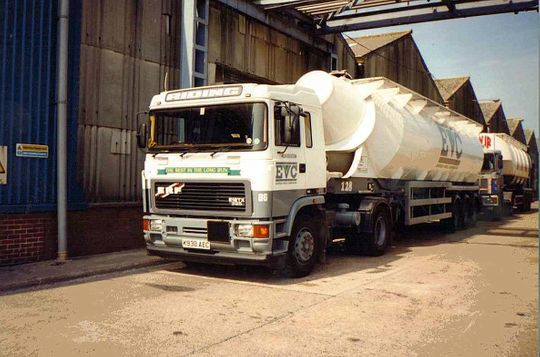 Pictured here in Longridge yard, hooked up to Metalair tipping tanker, is another Seddon Atkinson Strato 4x2 tractor unit that was registered new on the 17th of August 1990. Reg No H860 VFV Fleet No 9 'Dreadnought' was driven from new by Ian Smith and powered by a Perkins TX engine. It generally worked out of the ICI Runcorn works in European Vinyl's Corporation Ltd livery. A rear end shot of Seddon Atkinson Strato 4x2 tractor unit Reg No H860 VFV Fleet No 9 'Dreadnought' during tipping operations. Driven on a regular basis by Ian Smith it is pictured here while Ian was discharging a fifty five cubic meter tipping tank at Anglian Windows in Norwich. This particular photograph was taken by the ICI publicity department. 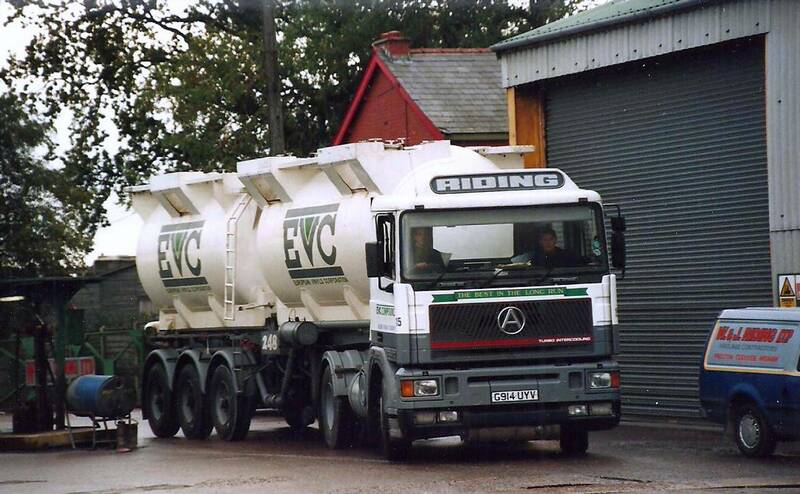 'E' Series ERF 4x2 tractor unit Reg No K730 URN Fleet No 6 'Sir Lancelot', registered new on the 1st of February 1993, is seen here while tipping one of Riding's Metalair 55 cubic metre tipping tanker's full of Corvic at the Unidare plant in Portadown Northern Ireland. With still one ram left to go it would be no problem for the outfit as it is stable and on firm ground. Another day and another delivery for 'E' Series ERF 4x2 tractor unit Reg No K730 URN Fleet No 6 'Sir Lancelot'. 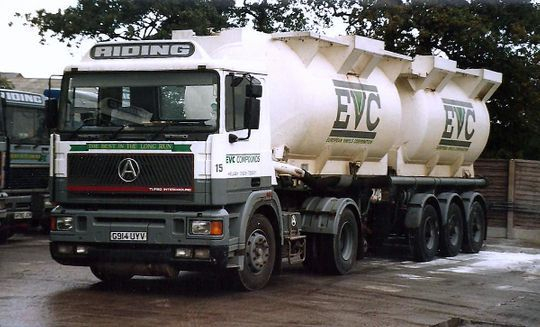 Powered by a Perkins E12TX 325 engine it was driven by Fred Bretherton who is seen here delivering pvc to the 'PVC Group' Stephanie Works factory at Chinley High Peak Derbyshire. This particular delivery point necessitated reversing about 300 yards down a track as there was very little room to manoeuvre. 'E' Series ERF 4x2 tractor unit Reg No K730 URN Fleet No 6 'Sir Lancelot', registered new on the 1st of February 1993, was immediately assigned to the ECV contract. Powered by a Perkins E12TX 325 engine, and driven by Fred Bretherton, this close up shot shows it parked in the depot at Longridge whle coupled to a 2000 cubic foot non tipping tri-axle powder tanker built by Carmichael. 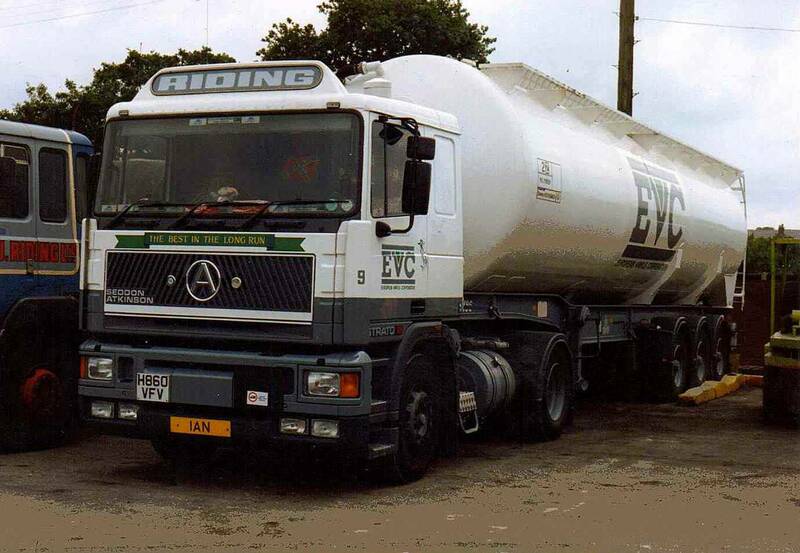 'E' Series ERF 4x2 tractor unit Reg No K930 AEC Fleet No 86 'Sir Barnaby' was registered new on the 1st of February 1993. Powered by a Perkins E12 325 engine it is seen here on the 9th of September 1993 on the southbound M1 Toddington Services in Bedfordshire and was driven by long time serving Riding's driver Ken Marle. 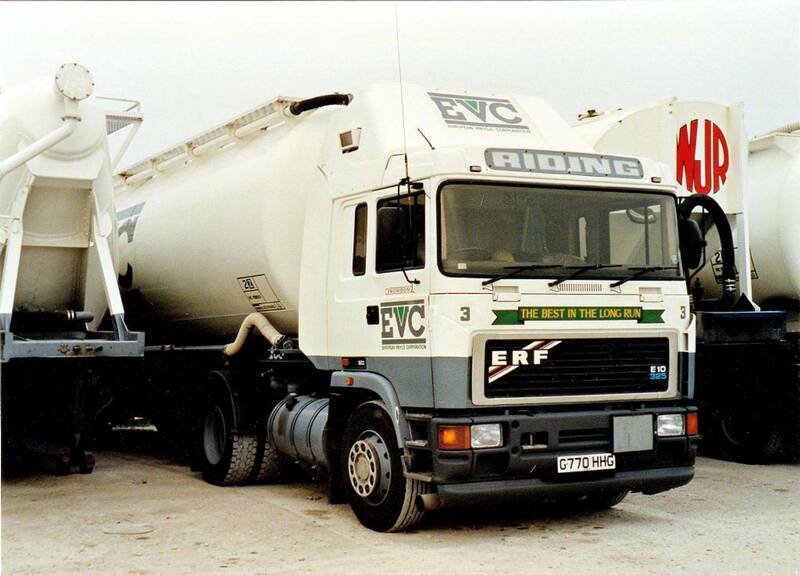 Allocated from new to the EVC contract this particular ERF stayed on this job for most of it's working life at Riding's. 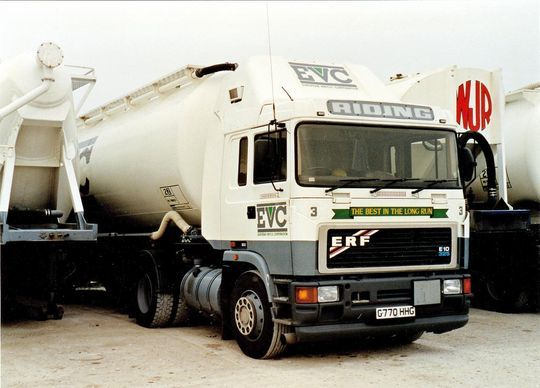 Another shot of 'E' Series ERF 4x2 tractor unit Reg No K930 AEC Fleet No 86 'Sir Barnaby' as it prepares to load up a Carmichael 2000 cubic foot non tipping tri-axle powder tanker at the EVC plant at Barry in South Wales. In another photograph, taken at the EVC plant in Barry South Wales, we again see 'E' Series ERF 4x2 tractor unit Reg No K930 AEC Fleet No 86 'Sir Barnaby' coupled up to a Carmichael 2000 cubic foot non tipping tri-axle powder tanker. 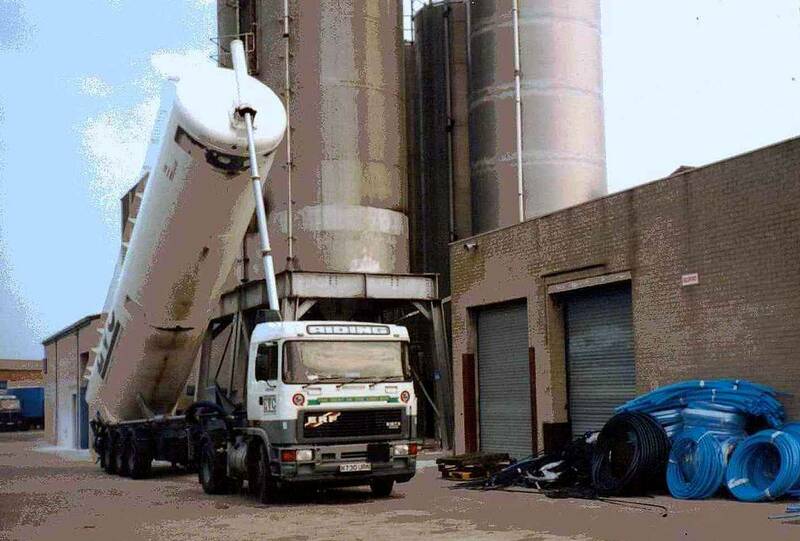 Parked behind, also waiting to load up, is an unidentifiable Seddon Atkinson Strato coupled to a Crane Fruehauf 1450 cubic foot tanker in full Riding's livery. Allocated from new to the EVC contract 'E' Series ERF 4x2 tractor unit Reg No K930 AEC Fleet No 86 'Sir Barnaby' certainly earned it's keep and covered some miles during it's life with Riding's. Having already been seen above in previous photographs at Toddington Services in Bedfordshire and Barry in South Wales this particular picture shows it parked up on the M6 Southwaite service area in Cumbria. Foden 4x2 tractor unit Reg No M920 UCW Fleet No 85 'Hardwicke', registered new on the 1st of January 1995, was Longridge based and driven by the late Ted Woods. 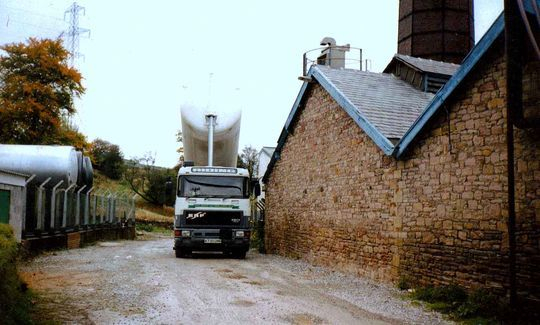 Powered by a Perkins 335 TX engine, as were all the Foden's in the fleet, it is seen here heading South on the AI in North Yorkshire while hauling a 55 cubic metre Crane Fruehauf tipping tank used exclusively on the European Vinyl's Corporation contract. Ted had 45 years service with the company and was the first bulker driver at Riding's when they started the tanker business in 1968. During his driving career with the company Ted had ten brand new units and M920 UCW was the ninth in the long line a record to be justly proud of. A close up shot of Foden 4x2 tractor unit Reg No M920 UCW Fleet No 85 'Hardwicke'. 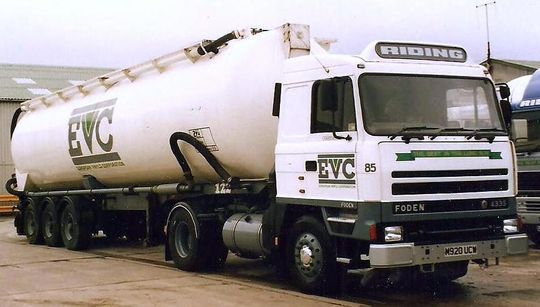 Pictured here parked in the depot at Longridge while coupled to a Crane Fruehauf tri-axle 55 cubic metre tipping tank M920 UCW was driven by the late Ted Woods. 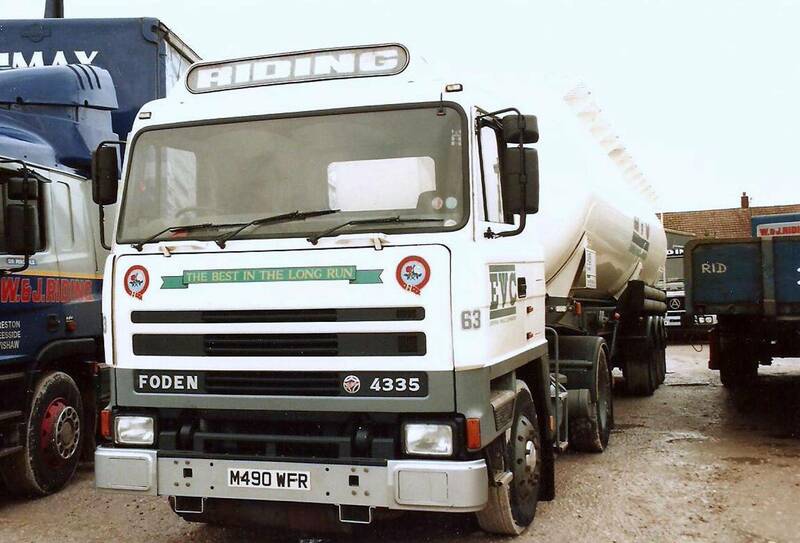 Foden 4335 4x2 tractor unit Reg No M430 URN Fleet No 11 'Coeur-de-Lion' was registered new on the 1st of February 1995. 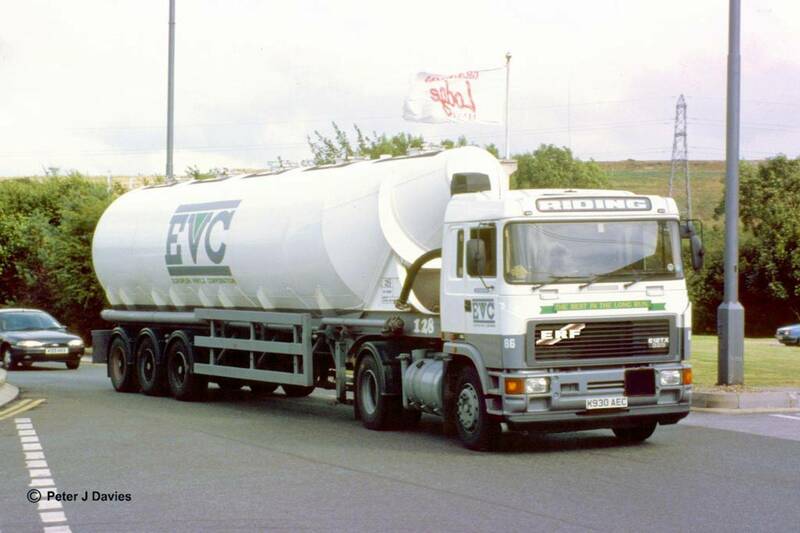 Coupled to a 55 cubic metre Crane Fruehauf non tipping tanker, in European Vinyl's Corporation Ltd contract livery, it is seen here arriving back at Longridge depot on the 23rd of December 1995. Powered by a Perkins 335 TX engine it is seen here parked up in the depot in Longridge on the Monday the 23rd of October 1995. 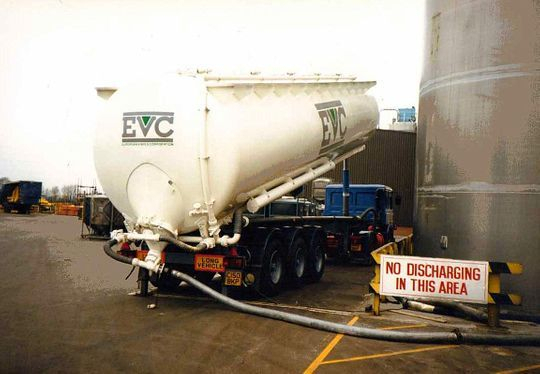 One of a pair of Foden's Riding's registered new on the 1st of April 1995 it is seen here when new pulling a 2000 cubic foot Carmichael tanker used exclusively on the EVC contract. This particular outfit was used for delivering pvc in bulk nationwide from Runcorn in Cheshire and Barry in South Wales. Another on the road shot of Foden 4335 4x2 tractor unit Reg No M520 WCW Fleet No 67 'Thane-of-Fife' shows it travelling along the A585 towards Junction 3 of the M55 in Lancashire. 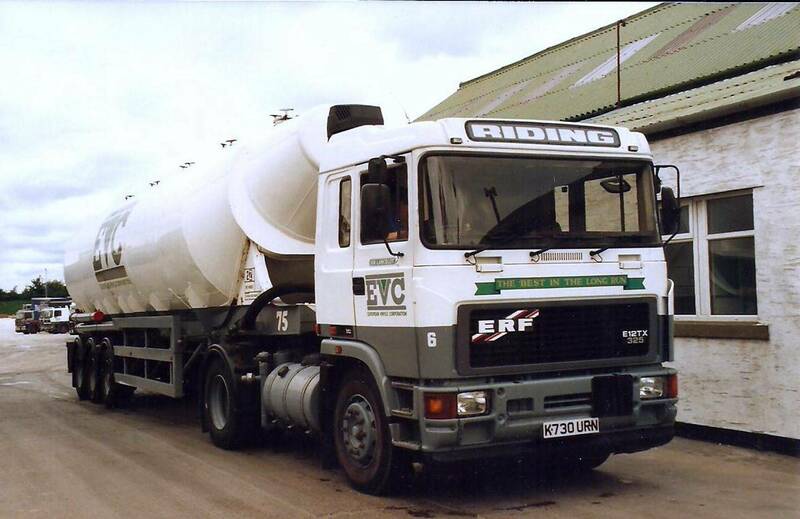 Pictured here on the 13th of June 1997, when just over two years old, you can see the Riding headboard and 'Best in the Long Run' logo has now long gone having been replaced with the TDG Nexus livery which came about after the retirement of Tom Riding in October 1995. 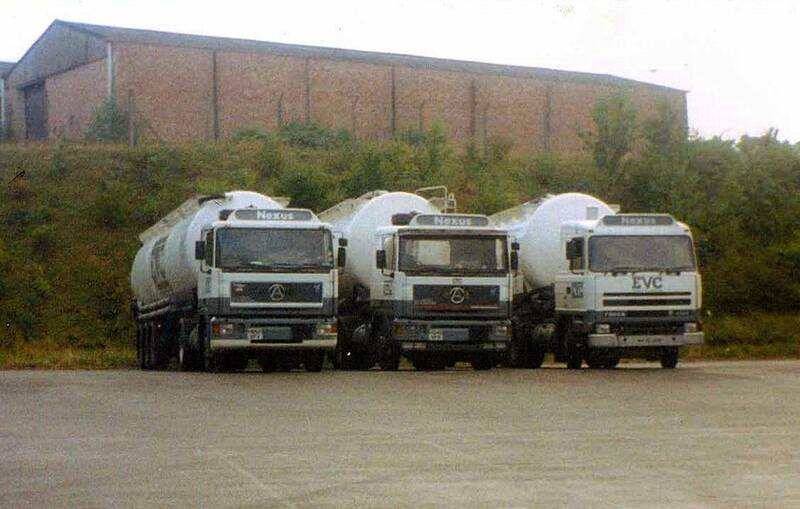 This photograph taken by Rex Rich, shortly after the retirement of Tom Riding in 1995, shows three Riding's vehicles parked up on Friday night at Chepstow ready for going into Barry on the Saturday morning to load and then saunter home back north. Seddon Atkinson Strato Reg No H860 VFV Fleet No 9 'Dreadnought'. 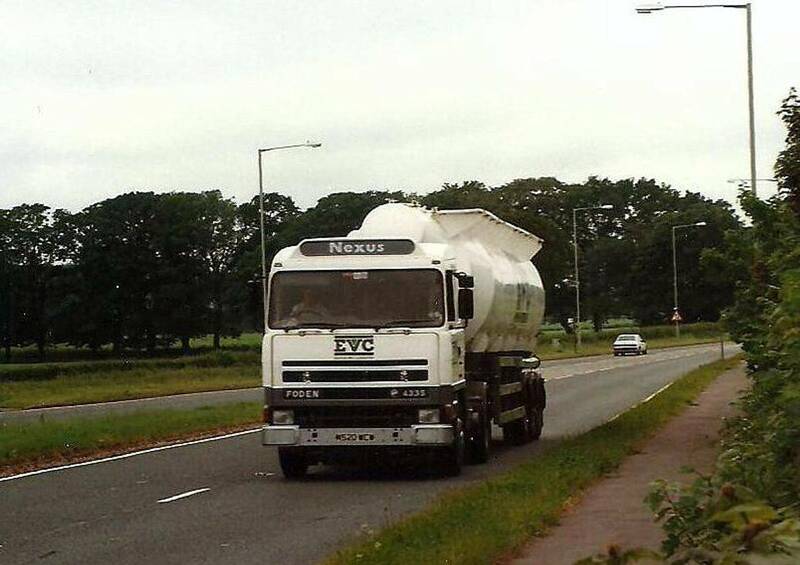 Seddon Atkinson Strato Reg No H 840 VFR Fleet No 1 'Precursor'. Foden 4335 Reg No M520 WCW Fleet No 67 'Thane-of-Fife'. The drivers at the time were Howard Quick, Mick McKay and Rex Rich'.